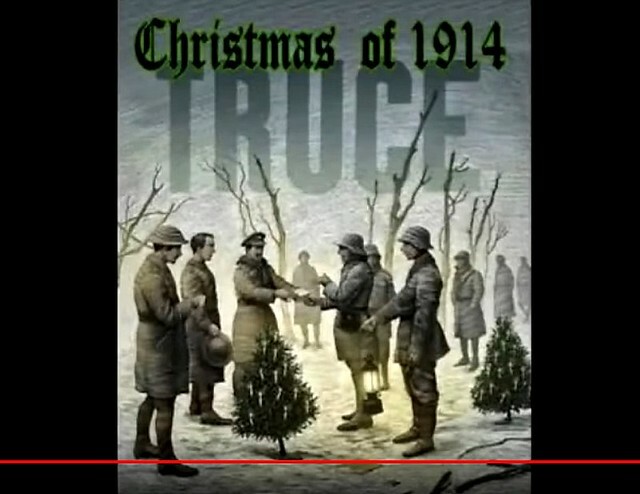 The “Christmas Truce of 1914” was a short-lived, unofficial lull in combat between two antagonistic rival forces, determined to exercise military, political and economic supremacy over each other in Europe and in the colonized world, to which these imperial powers lay arrogant false claim. One of the bloodiest episodes in human history, World War I was largely played out on the battle-scarred lands of France and Belgium, starting in August of 1914. As an undeclared truce, started by rank-and-file soldiers on trench-carved terrain, the truce was seen taking place in sporadic locales all along the Western Front, on both sides. The truce is said to have been started first by German soldiers singing Christmas carols, followed by like responses from the other side. However, by New Year’s Day of January 1915, soldiers of these imperialist armies had been forced to return to the senseless slaughter that left millions dead, missing, wounded and/or mentally scarred for life at its inglorious end. We are virtually at the doorstep of its 100th anniversary. The Herculean efforts to oppose the war, led then by Vladimir Lenin and the Bolsheviks in tsarist Russia, remain applicable to this day and summon the critical need to revisit them with an unavoidable urgency. Contrary to the massive hype that is obsessively promoted in this country, it is U.S. imperialism that continues to threaten peace and human development throughout the world. Anti-war forces in this country are duty bound to help dismantle its deadly tentacles. It is of paramount importance to understand that wars generated by capitalism and imperialism serve the class interests of those in power, at the awesome expense of the working class, which is used as cannon fodder to fight in them. In stark contrast, wars of national liberation become imperative when activated to free a nation or territory from colonial or neocolonial rule, after all other political efforts have failed or been exhausted. This was especially true in the 20th century. Nations under imperial attack today have the right to use this option when their sovereignty is severely threatened or violated. It is known as self-defense. Prior to the outbreak of the war itself, much of Europe had been divided into two armed camps, under an alliance system that required “backup” if any member nation was assaulted by hostile forces. “An attack against one was an attack against all.” For the sake of brevity, the two armed camps were comprised on one side by the Triple Alliance, made up of Germany, Austria-Hungary and Turkey, and on the other side by the Triple Entente, made up of England, France and Russia, with Serbia as an ally of Russia. The immediate cause of war is attributed by some circles, but not all, to the assassination of Austrian Archduke Franz Ferdinand and his wife Sophie by Serbian nationalist Gavrilo Princip in June of 1914. Along with other Serbian nationalists, Princip wanted independence from Austria. The “fuse” had now been lit. By August of 1914, “the powder keg of Europe” had exploded. The carnage would last four years, at the cost of 20 million lives, ending on Nov. 11, 1918. Unofficial and short-lived, the truce was experienced all along most of the Western Front from Christmas Eve to New Year’s Eve. Some officers supported or tolerated the truce, while others called their troops “mutineers” and threatened them with death by firing squad if they did not cease fraternization with the enemy immediately. Soldiers from opposing sides openly shared cigarettes, cakes, beer, food, souvenirs and pictures of loved ones. They played soccer and held joint-burial ceremonies together, among other countless gestures of goodwill and comradeship. The act of this fraternization is itself one of the most heroic chapters in the history of the working class, because it exposed the bankruptcy of imperialist wars. Workers do not benefit from them. And, in significant respects, it can be seen as a delayed reaction to what Lenin and those determined Bolsheviks tried to head off at the Stuttgart and Basel conferences of 1907 and 1912, respectively, before the outbreak of the war itself, when the revolutionary wing of the international workers’ movement fought to prevent its onset. Even though the truce was of extremely short duration, the example the worker-soldiers gave fundamentally challenged the authority of kings, czars, kaisers and primer ministers to commit them to capitalist war. Imagine what a sustained resistance to this war would have looked like. One of the most effective tools for defeating imperialism is the refusal to fight for it. I’ve a strong sense that our comrade Andy Stapp, the late founder of the anti-war American Servicemen’s Union, understood the power of this resistance in a basic and organic way. We still cherish his most heroic example. Articles copyright 1995-2015 Workers World. Verbatim copying and distribution of this entire article is permitted in any medium without royalty provided this notice is preserved. http://noglory.org/ Video by Heathcote Williams and Alan Cox. On Christmas 1914 in the first world war, thousands of troops on both sides unilaterally declared a truce and played football friendlies instead of trying to kill each other. Their officers moved quickly to stamp out such peaceful developments and in the following four years 16 million people were slaughtered. This entry was posted in Anti-war, England-UK-Britain, Europe, France, Germany, History, Imperialism, Music, Socialism, Soldiers - Troops and tagged Christmas, Christmas Truce, Henry Hagins, John McCutcheon, WWI. Bookmark the permalink. The Christmas Truce was a glimmer of humanity in an inhumane time in history. It’s sad people refuse to learn anymore from history. Thanks, ashiftinconsciousness. Happy Holidays to you. One of my favorite war stories, when the beleaguered troops made their real feelings known. One of my favorites, too, Jenny. Happy Holidays!